Canada will host members of the Lima group of South and Central American countries next Monday in an effort to find a resolution to the turmoil in Venezuela, Foreign Affairs Minister Chrystia Freeland said today. The move comes days after Canada recognized Juan Guaido, the Venezuelan opposition leader, as interim president of the country and rejected Nicolas Maduro's government as autocratic and illegitimate. Guaido, the democratically elected leader of the opposition in Venezuela's National Assembly, declared himself interim president last week. "Since August 2017, Canada has been working closely as a member of the Lima group, which is comprised of over a dozen Latin American countries and the Caribbean, to address the Venezuelan crisis," Freeland said. "The Maduro regime relinquished any remaining legitimacy when it seized power through fraudulent and undemocratic elections on May 20, 2018. We now call upon Nicolas Maduro to cede power to the National Assembly, the only remaining democratically elected institution in Venezuela, in line with that country's constitution." The Lima group was formed in the summer of 2017 and includes Argentina, Brazil, Canada, Chile, Colombia, Costa Rica, Guatemala, Honduras, Mexico, Panama, Paraguay, Peru, Guyana and Saint Lucia. Canada has hosted the group for meetings before, including a ministerial level meeting in October of 2017. 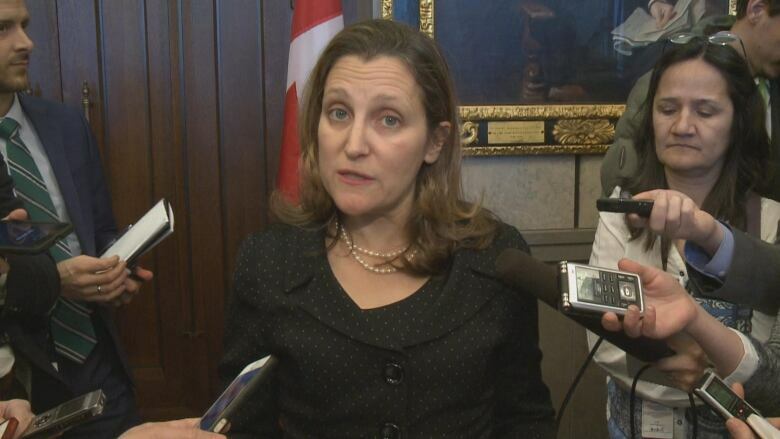 Freeland also said that Canada — along with Argentina, Chile, Colombia, Paraguay and Peru — referred the ongoing human rights abuses and squashing of dissent in Venezuela to the International Criminal Court prosecutor's office for investigation in September. A major oil producer, Venezuela has been wracked by hyper-inflation, food shortages and intense crime since Maduro came to power in 2013. Maduro's government accuses the U.S. and others of launching an "economic war" against Venezuela, blaming it for most of the country's problems.